Savage Decor: CC Certified: Christmas Cheer! I purchased my ornaments from Hobby Lobby, Home Goods, Nordstrom and Macy’s. The Reindeer came from TJ Maxx. If you’re not dreaming of a white Christmas or in the holiday spirit, then your name must be Scrooge! I’ve officially coined Christmas as my favorite holiday. First, because of its guaranteed family time. Secondly, I truly love decorating for Christmas. The day after Thanksgiving was always a big deal. I remember being a little girl helping my mom get the pre-lit reindeer, tree (one of her trees rotated and she recently donated it to her church) ornaments, garland and whatever else you can think of out of the storage. This having been a tradition in my family for years. My mom always made sure our house looked like a winter wonderland. The yard was always pristine and well-manicured when it came to her setup. Truth be told it was all about the PLACEMENT! You will notice in the pics. I never understood smile on my mom’s face when the extension cord was plugged in (sort of like the scene from National Lampoon's Christmas Vacation). Fast-forward this is my second year putting up a tree and I'm jazzed about it. I'm up on all the latest Christmas Decor trends! Keep reading I will share a few tips with you. My color scheme hasn't changed its cream/ivory, green, gold, and rose gold. I also bought a new tree. After 2 glasses of wine, a bottle of water, multiple trips to key stores, a holiday playlist on 10, a few solos incorporated with dance moves my tree was complete. I purchased my tree from Target. Tree - Your style depends on the type of tree. I prefer pre-lit flocked branches with a little snow. My black Christmas tree is sitting in my cart right now! Lights - Multi-color, solid, clear, white, and warm (there is a difference between clear, white, and warm lights) and motion. My preference is warm. Fillers - This is a must for my free. Flower stems and ribbon are key. Also fluffing your branches plays a key part in the fullness of your tree. Table setting - It really depends on if you eat the table, how much space and the functionality of it. Wreaths - Says everything about your holiday decor on the inside before people see it. I love a fresh Fraser Fir wreath. But I've opted for an artificial wreath because of condo living and the door being on the inside. Wrapping paper - Yes, yes, yes that's part of the plan…PRESENTATION! Storage - This is the most important part. If you are investing your time and hard-earned coins into all this decor a storage bag for your tree is a must. I prefer a rolling one, so I don't have to ask or wait on anyone else to get it. Also, I wrap each ornament and layer the storage bin with bubble wrap and repeat at each level until full. Now I understand the smile on my mom's face. Christmas brings a variety of joy in multiple forms. Some will say she only cares about decorating. What about the true meaning? Truth is everything about Christmas makes me happy. Remember holiday decor will always be on sale the day after Thanksgiving. However, it will be even cheaper on December 26. 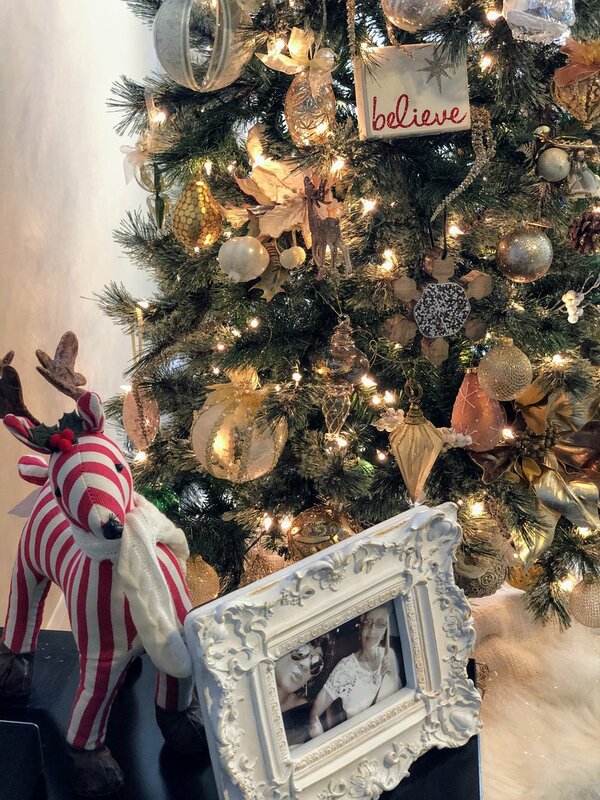 Drop a line or share some of your decorating tips, your favorite memory, or what gets you in the Christmas spirit. Stay tuned for Hill Holiday Designs. Until next time Merry Christmas!